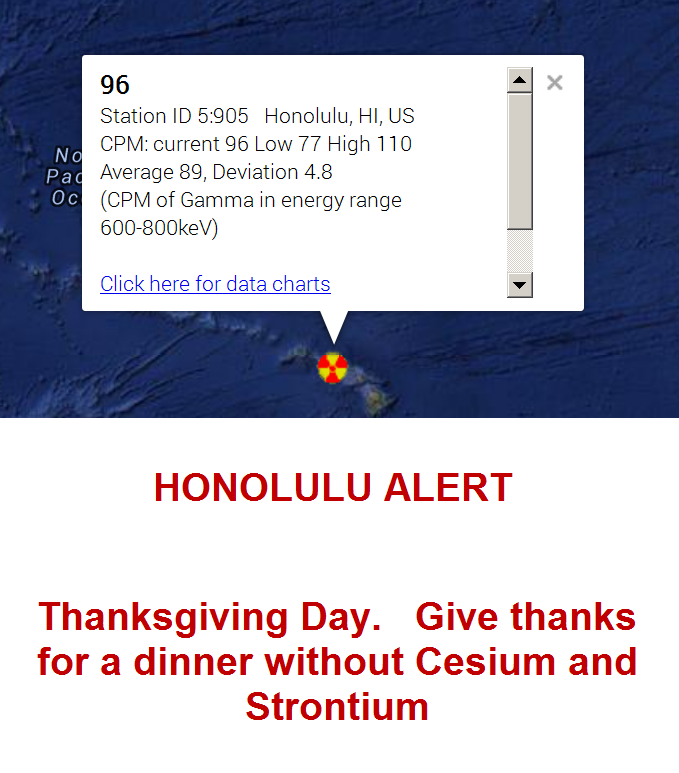 Nuke Pro: West Coast Pelted with Radiation AGAIN on Thanksgiving! 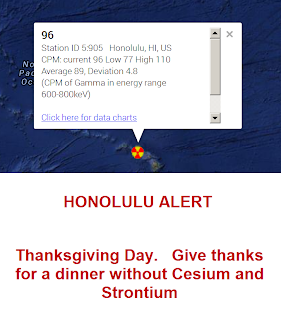 West Coast Pelted with Radiation AGAIN on Thanksgiving! The 600 to 800 mEV range is likely to be Cesium and Strontium, 2 of the most prevalent and most dangerous from Fukushima. Bottom line - get a Geiger or you have no ability to assess your risk. And there are occasional high risks. San Francisco, Olympia Washington, and Richland Washington are under high ALARM today. San Francisco is around 300 CPM (Clicks per Minute), and Richland WA is over 500 CPM! Milwaukee direct read on 8 hour run, 12730 clicks with an Inspector Pancake type Geiger. This is not bad and close to baseline, and after a light snow. Usually the rain and snow bring down the airborne radiation. So Milwaukee is a 26 CPM, that is not bad. Use this Radiation Chart for interpretation. "The turkey is extraordinarily tasty this year, honey !" "Really ? You know, I added some very special ingredient this time; you'd never guess what it is... Anyway, I'm so glad you like it !" "Oh yes, I do. I can truely feel all the love you put in there, darling. Believe it or not, that feeling is so strong, it literally creates a warm feeling in my belly." what is the best geiger counter to buy? can anyone suggest which monitors the correct isotopes etc for us who are non-science majors? P.S. Don't get me wrong: this is pure sarcasm. Given the ignorance and stupidity of the vast majority of people everywhere (at least that is my impression), it saves me from committing suicide right away. I admit it is hardly helpful, and I'm seeking for a more productive way to deal with the situation. Yep, pretty frustrating. People ahve no idea how bad this is going to be. I think they think I'm some sort of nothing or a doom and gloom merchant :( Sending love to you. Yep, it is always risky to kill the biggest ocean on your HOME PLANET. Does it really matter? There is Nothing that can be done about it now... It's too late for humanity.... The Idiots won! Its not over yet, and there are some positive trends in terms of plant closures, but also negative trends in terms of Gov denial and media blackout. So yes it does matter. I see, when the trolls show up, that must mean one is hitting close to the mark. The 2 A are indeed Washington and California. Try http://www.radiationnetwork.com/ for a radiation map that gets updated regularly ... and don't drink the cool-aid. Ah yes, you know when a website hits the big time, when the deniers show up. Here is your link showing lots of 50, upper 40, 80 ....oh sure, all is normal, 25 is normal for most areas. 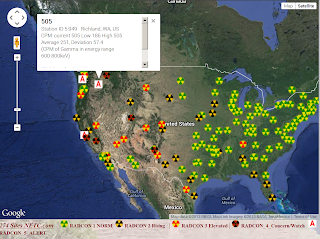 Well there was no abnormal levels of Radiation near Portland .Oregon . I take readings every day and all of them are normal . I also check with Radiation network daily it takes readings all over North America and all is normal . Post up your data please. Well maybe you should visit a reliable radiation site such as http://www.netc.com/ you'll find out that the radiation levels are way above normal!!! If Richland, Wa has high radiation readings it's probably associated with Hanford, a nuclear waste site. High radiation readings can come from anywhere. I bet you didn't know eating a banana will increase your potassium levels. Which by the way is radioactive. There are 2 kinds of radiation, man made and background. Look into it before you start a mass panic. Hilarious, a troll trying to justify the radiation, pretending it is background. And then trots out the inane Banana argument. First off, the human body regulates potassium to a constant level. You can eat all the bananas you want and you won't change your potassium level, no radiation change. And the whole lie of background radiation, is a lie right out of the gate, read up here. A couple of comments, www.netc.com does not tell you whether the levels are bad, they use average CPM's and then base the alerts on whether the CPM's are rising, elevated or at the top of the deviation, which set's an alert. I follow netc and #1, since fuku the averages have gone up 35%. #2, in the last two weeks, the averages have gone up 20%. Where is the radiation coming from? Ison debris? The Sun? Fuku? Also, the radiationnetwork site is owned by whom? I would not trust it. This is not over yet people are more worried about watching football and shopping for xmas. OBLIVIOUS to this ELE! Thanks for the input. I have also noticed radiation network showing "normal" when my own geiger was showing elevated, and even when EPA radnet was showing skyhigh. So its odd for sure. I to have been wary of netc's postings. The ones over on Japan are a JOKE! Many of the brand new sites (esp in Oregon) are way too low...maybe lacking sensitivity.